BatteryPete is proud to offer replacement parts for your Delta Q Technologies battery charger. Sometimes life just happens and things break from falling off a work bench or getting driven over in the shop. Whatever the mishap may be BatteryPete has you covered. Pete has access to a wide range of parts for your Golf Cart Battery Charger whether its a Lester Electric or the Delta Q. Sometimes we all need something that it hard to find in other stores or shops so Pete decided to bring on at least one of every possible replacement part available from either manufacture. This will keep you and your golf cart moving this summer without breaking the bank. Why buy a new Golf Cart Battery Charger when you can just find the replacement parts you need? Whether it a AC cord for your Quiq charger or a new connector for your Lester charger. Speaking of Golf Carts and replacement parts BatteryPete will also be bringing on the US Battery line of batteries. if you are looking for high quality Golf Cart batteries, Rv batteries, whatever the application Pete has it. All the flooded batteries (Traditional Lead Acid) will ship from our south Florida location up the east coast of Florida – from Miami to Daytona. You can always call us to see if delivery is available in your area or state because Pete has a very large network of friends and battery specialists throughout the country. So feel free to call us now at (772) 444-2280 to speak with a BatteryPete Team member and help you find the Golf Cart Battery Charger Replacement Parts or battery you need for your golf cart or EV. Or you can keep reading to learn more about your golf cart battery charger today. BatteryPete even offers Golf Cart Service at select locations. Please call to see if there is a registered BatteryPete service center near you. BatteryPete certified techs will be able to give your golf cart a inspection and fix any issues in no time and you can rest assured it will be done right at a fair price. 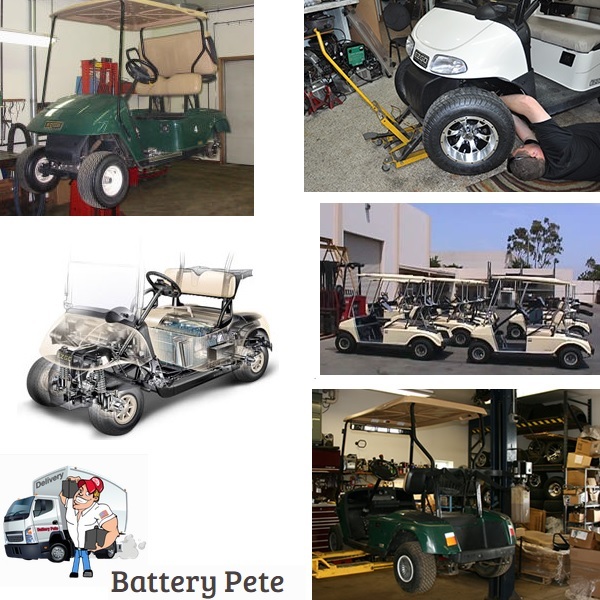 BatteryPete certified repair facilities only use the best replacement parts for your cart. All parts are direct OEM replacement parts or OE quality. All parts will always be new and made in the USA.